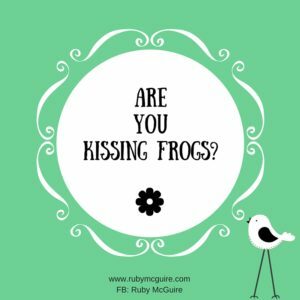 Are you kissing frogs? 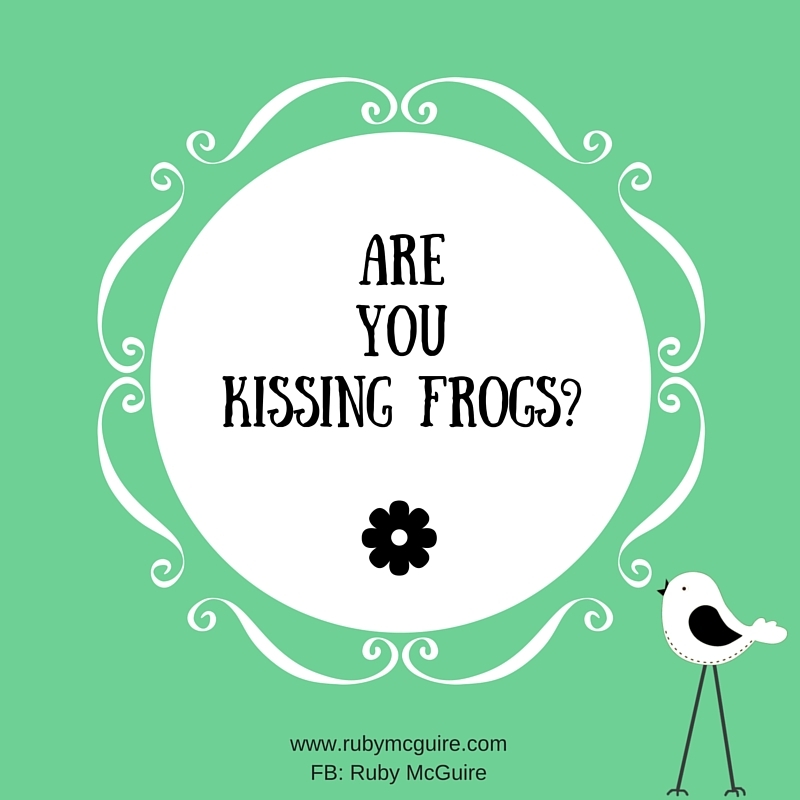 In this blog post, I’m going to share how kissing frogs might be part of the process when building your business and how you need to get super duper clear on who you want to work with. So often we settle for our lot in business and life. We think we only deserve a certain amount of happiness and that can really limit us. I remember back when I was single after going through my divorce, lots of friends kept telling me I should go out with this person and that person, but I told them that I didn’t want to settle. I wanted to find the right person for me. I had a comprehensive list of what I wanted in a man. Yes, that might sound a bit excessive, but hey I ended up with my soul mate so you can’t argue with that! 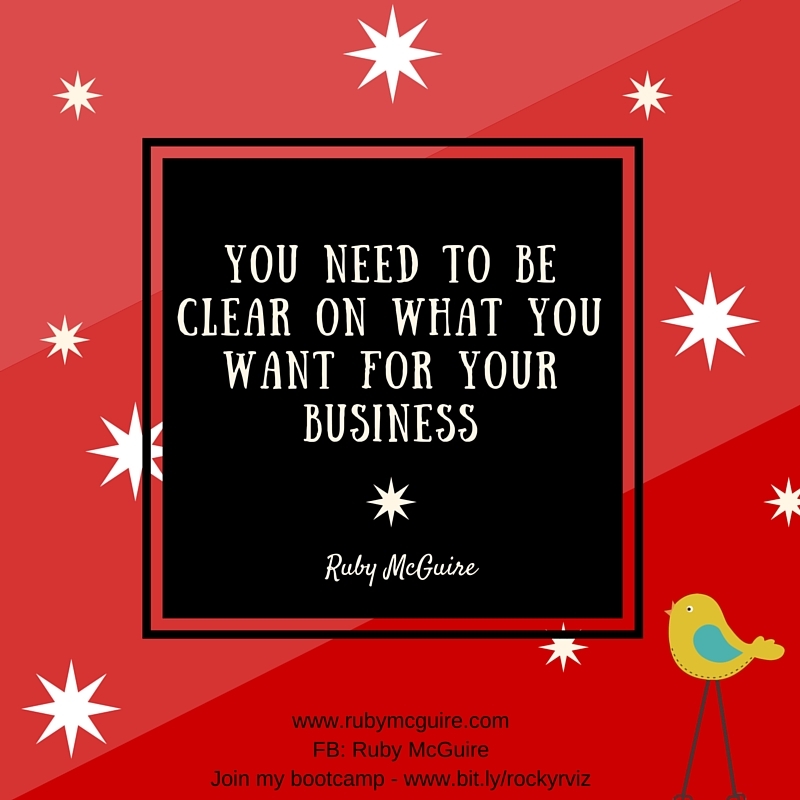 I think clarity is so important, in all areas of your life, but especially when running your own business. You need to get really specific about what you want. Back to these friends of mine, they said my list for my ideal man was too limiting and that I should compromise, but I didn’t want to. They said I’d be missing out on great opportunities, and could be holding out for something that wasn’t right for me. I disagreed. I knew I’d rather wait for the right person than settle for the wrong person and regret my decision, which wouldn’t be fair on either of us. Trust me, I had to kiss a few frogs along the way! Oh, the stories I could tell about some of those dates – wowzers. The dating world is eye-opening for sure!!! What’s all this got to do with business? Well, quite a lot actually. Like my friends telling me who I should go out with, you will get people telling you how to run your business, what clients to work with and what you should be doing/not doing. The thing is, there is no one-size fits all in business. 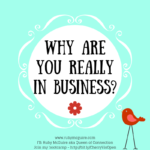 Yes, there are methodologies that are tried and tested, proven to work, so you’d be mad not to incorporate them, but the beauty of running your own business is you get to run it your way. I had a full list of what I did and didn’t want in a man. 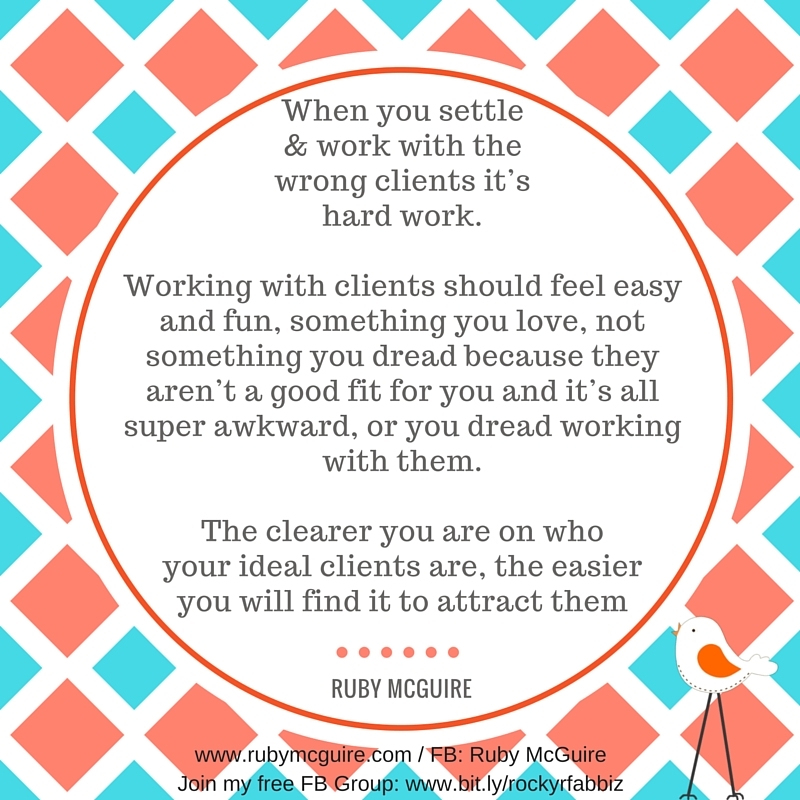 If you were to apply that to your ideal clients, would you know who you do and don’t want to work with? You need a vision, a bit like my list. I was able to visualise the kind of relationship I wanted to be in, as I’d written out all of the qualities of the man I wanted and how life would be when I met him. I knew that when I found the right person everything would fall into place like a jigsaw puzzle. 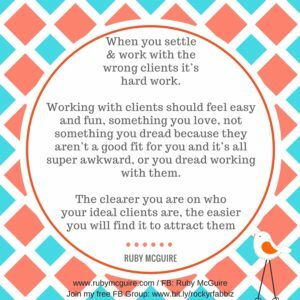 The same applies to your ideal clients, when you are really clear on the type of people you want to work with, you’ll find the same thing happens. You might find yourself wavering when the right people don’t come along (enter the frogs!) but maybe it’s because you’re not being clear enough. Maybe your messages aren’t talking to your ideal clients. So you may be wondering how we met. We met online, he was working in Iraq doing close protection work when I first started chatting to him. It was back in the day when online dating was more taboo than it is now – it was one of those things you didn’t really share with many people for fear of being judged. I had to pull together an online profile that summed up me and what I was looking for. I was very specific (my list came to my rescue again!) Trust me it seemed a tall order, but specificity works! Have you ever felt like that in business? When you don’t want to share your business for fear of being judged for saying/doing the wrong thing, being ‘too big for your boots’ and thinking that people will question your reasoning. I felt like that when sharing the whole online dating thing with people. It all started off as a dare for me (I’m a sucker for a mini dare!) when my friend challenged me to go speed dating. I said it wasn’t for me, and the next best thing was online dating. Nothing like pushing your comfort zones! So, my ideal husband list was too limiting apparently, I should compromise. No, thank you. Compromise is not in my dictionary, I like clarity, specificity and don’t think you need to settle. You can dream big and make it happen. A bit like the ‘fear strategy’ my friends were doing with me. You think when you get clear on who you really want to work with that it’s going to stop you from connecting with the right clients. It’s funny because it actually strengthens your position, you don’t waste time with people that aren’t your ideal clients (timewasters – in my case back then my non-ideal partner). It sets you apart as the one to work with, because you’re so clear, or the one to fall in love with in my case. If you believe in the Law of Attraction, like I do, then you’ll know that you can make anything happen. When my now hubby and I used to chat over MSN (the Skype of its day) his soldier friends would ask him who I was. His reply was, ‘She’s my future wife, she just doesn’t know it yet’. When you settle and work with the wrong clients it’s hard work. Working with clients should feel easy and fun, something you love, not something you dread because they aren’t a good fit for you and it’s all super awkward, or you dread working with them. The clearer you are on who your ideal clients are, the easier you will find it to attract them, just like my lovely man. So if you’re settling I want you to think about what you really do want for your business. Who are your ideal clients? Draw up a list and then speak to them, make all of your messages about them. Okay so you might kiss a few frogs along the way as you figure it all out, but you might also find your prince/princess along the way! 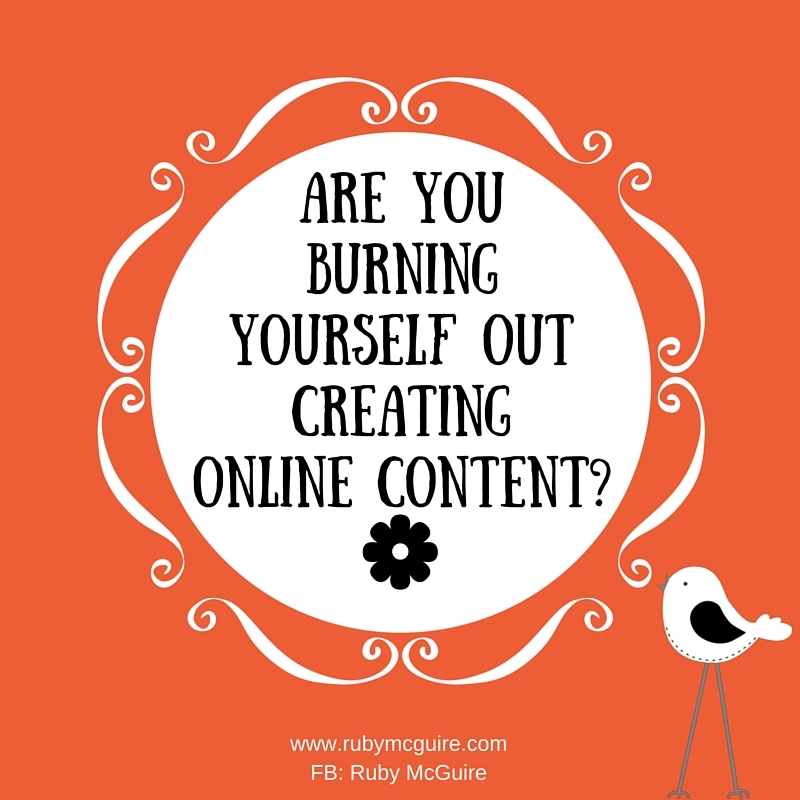 Are You Burning Yourself Out Creating Online Content? In this blog post, I’m going to get you to think about the way that you’re creating your online content. I’ll also be sharing one little word that could seriously change how you create your online content. 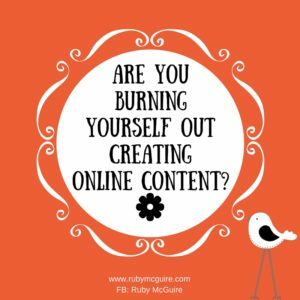 Are you burning yourself out creating online content? There are so many things to think about, aren’t there? What do you blog about? 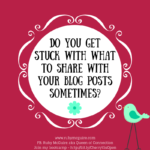 What do you share on social media? What do you turn into quotes? Does it all fill you with dread? Everyone’s telling you that you need to be visible on social media, and if they’re not I am! It doesn’t matter whether you’re running an online OR offline business. Even if you work mostly offline the first thing that people do now when they meet someone they might want to work with is Google them. If you have no online presence well you could potentially have no business. 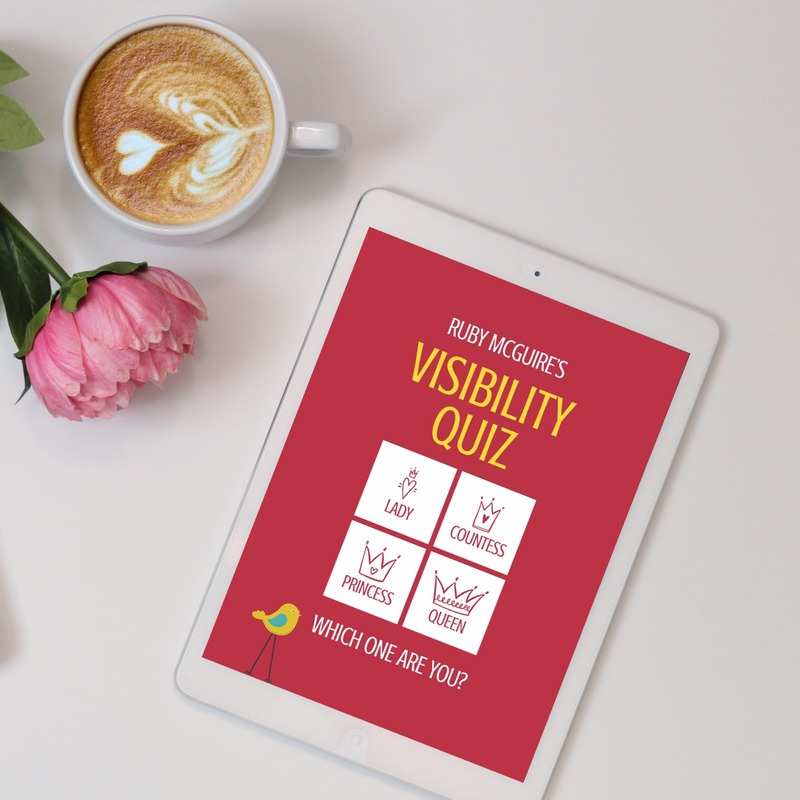 Last week I ran my first Super Charge Your Visibility Masterclass. The first class was all about creating super fast content. 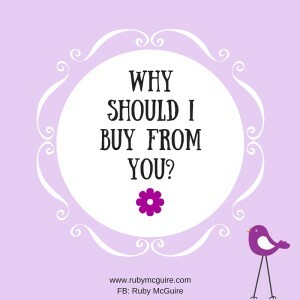 This question comes up so much from my clients. I thought I’d pull together all I know about creating content really quickly without you having a meltdown. In today’s post, I’m sharing a few tips to help you. Firstly and most importantly, the biggest thing you need to know before you create a single piece of content is who your ideal client is. If you don’t spend time figuring this out before you start then every single letter you type is wasted. You could find that potentially the wrong people will be reading it. 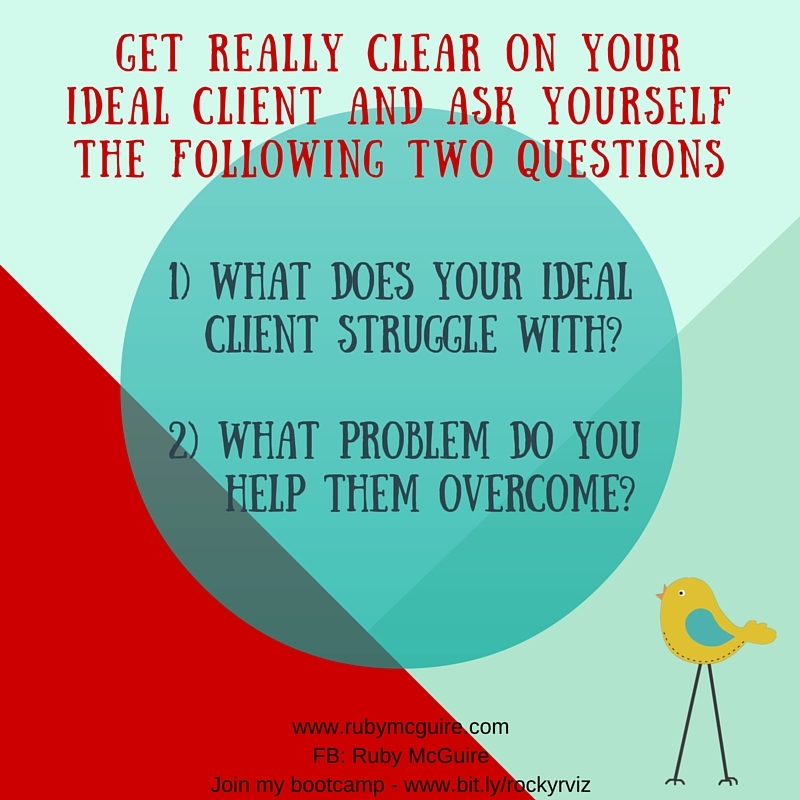 What does your ideal client struggle with? What problem do you help them overcome? Once you know these two things then you are going to be able to tailor your content into something they love and want to read. Please, please, please figure this one out. There’s nothing more disheartening that writing content and nobody notices it! I know, I’ve been there! 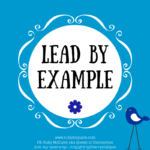 I shared a model with them that shows how I take a simple tweet and repurpose it into Facebook and LinkedIn posts, video posts, blog posts, podcasts, eBooks, course materials and more. Stuck for inspiration? Refer to your swipe files, it will help to inspire you to come up with something new. I like to share other people’s articles, it’s a great way to spread the love and it can also encourage conversation. Write down what you know about what you do, and the ways it helps people. Ideally, get a long list of topic areas and then break them down. So let’s use one of my topics of fear – I could write about fear of being visible in general, fear of speaking in front of a room full of people, fear of judgement, fear of being compared to others, fear of doing a video etc. etc. All of these fit within my main niche. Then plan out in a Google calendar or diary roughly what you could post and when. So for mine I don’t tend to do a series as I like to be a lot more flexible than that. If I’ve got a topic header in my diary I’ve got something to work to. If I don’t want to do that topic I simply swap it out with something different for that day. Simples. This one little word could seriously change how you create your online content. You don’t need to keep reinventing the wheel! Are you worried that people will think you’re saying the same thing? Don’t. What you do is create a twist with your content, so when repurposing you don’t necessarily use exactly the same words, you add your twist. PLUS people don’t always see what you share the first time, or you might have new followers that have never seen what you put out AND we know how it is – we might know stuff but sometimes we need to hear it again on that day, in that moment and that’s when the magic happens. My podcast post gets shared on my blog with the transcript of the post and a mini player so people can read or listen. I turned a blog post of 7 top tips in to various media – FB live posts, standalone videos, an infographic, a mini worksheet etc. Visibility tips get turned into group questions, posts on FB and LinkedIn, shared on Pinterest and now turned into FB live content triggers so I have a topic to talk about. I combined 3 blog posts for an article I’ve written for Insight Magazine, a publication by IIC & M (International Institute of Coaching and Mentoring). I use quotes on my FB page, share them on Twitter and Linked In. I then use them in blog posts and groups to motivate and inspire and add to my online programmes where relevant. I’ve used content from my co-authored chapters of the Dial A Guru book one. 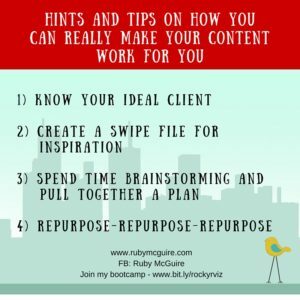 Now that that little extract I just shared with you there (from where I started talking about worrying about people thinking you’re coming up with the same stuff to the Dial A Guru book bit… It’s all from my Super Charge Your Content masterclass – repurposed. 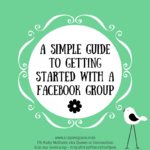 So, I hope that’s given you a starting point in how you can create your content. 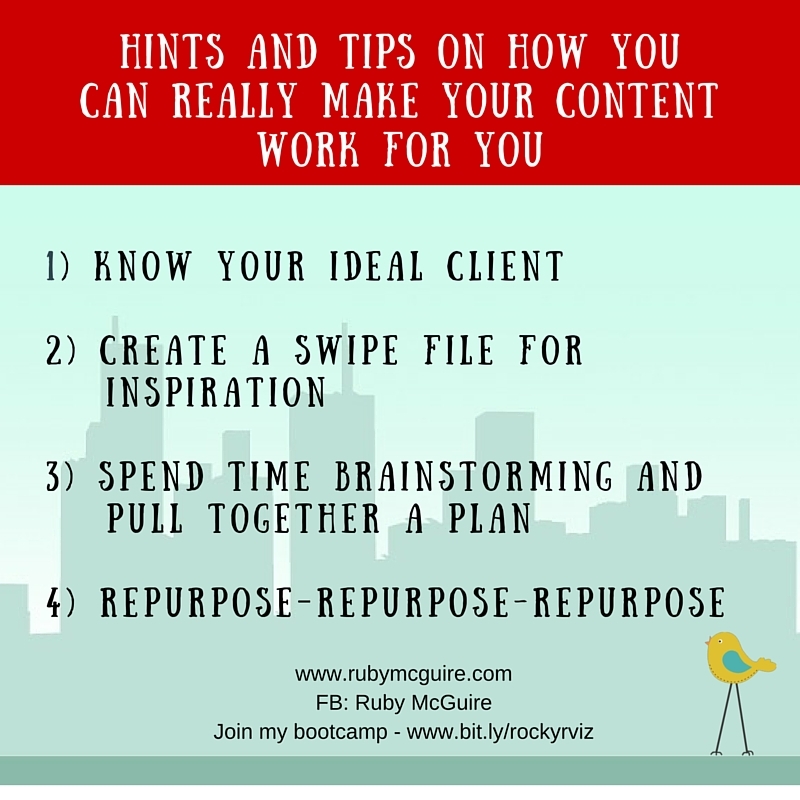 Your call to action this week is to write down 3 ways that you could repurpose your content. I’m going to tell you a little story about a lady called Sally. Sally was feeling inspired and invigorated. She was finally following her passion and was enjoying running her own business. That was until she read her bank statement, and realised that she wasn’t going to meet the bills again this month. Sally sat down and started to think about what the problem might be. ‘I’m really good at what I do. I know I get fantastic transformation with my clients. Nobody told me it would be this hard. If I’d have known I wouldn’t have signed up. I definitely didn’t sign up for THIS.’ She hissed the word, ‘this’ and felt contempt for all of the stories she’d read online about how running your own business was so amazing. Her demeanour softened slightly as she reminded herself that actually it was amazing, it just wasn’t paying the bills right now. She’d been online and heard all about how she needed to niche. That was all well and good but how was that going to pay the bills? Each time someone mentioned they needed help she simply said ‘yes’ because she needed the money. She then resented working with them where they didn’t take action or responsibility for their lives, or they were bad payers. They weren’t the right fit. She knew deep down that something needed to change. She was working with any client that came along and had no idea who her ideal clients were, what to offer them or where to find them. Working every hour under the sun just to keep on top of things wasn’t working. Things were slipping, she was forgetting things, the house was being taken over by washing and she had no family time. ‘Not what I’ve signed up for at all’, she muttered again. Maybe you’re a guy that’s finding you’re so busy being out there that you don’t have time to meet your friends down the pub any more, or even the funds, or maybe you’re working so hard that you don’t even see your family, other than on Skype. You need to get really clear on who your ideal clients are, pull together a plan of what to offer and where to market to those people. You can still attract clients that are outside of your niche, but you will save so much time, energy and money focusing on the right people; people that want what you offer. My husband was sharing a story with me about how years ago he did some temp work for a telesales company. He had an enormous list of people to cold-call (shuddering at the thought of that one) and he had to ask them about their multi-platformed servers and how they might want this particular service the company was offering. His list consisted of solicitors, lawyers, small business owners, who wouldn’t know what a multi-platformed server was if it fell from the sky. A complete waste of time for everyone, and not great for the company concerned in terms of reputation and credibility either. They weren’t clear on their target market, their ideal clients. You have to get clear on this. 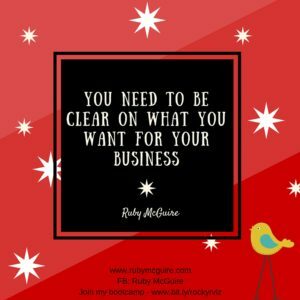 Getting that clarity will build your business. You become the expert, the go-to person in your field. Result = clearer marketing messages – blog posts, newsletters, articles, social media posts and conversations, and most importantly more clients. I get asked so often to review websites and check in with people about what they should be saying about what they do, and I will always go back to asking who they want to work with. It sounds simple, but if you’re like me when I started I would say I’m a coach – I can coach anyone. That’s what my skills give me. Yes, but saying you can coach everyone isn’t going to get you in front of the people you need to be in front of. Let’s get blunt here – why should I buy from you as opposed to any other million and one business owners offering the same service that you offer? Whether you’re a beautician, graphic designer, coach, nutritionist, spiritual healer – it doesn’t matter. You’ve got to sell it to me baby! Telling me in a fluffy way what you do isn’t going to make me understand why I should choose you over others. The reality is if you’re not getting your message clear there will be one of your competitors out there that is, and those lovely clients that you so long for will be banging down their door instead of yours. You have to stand out from the crowd. Now, yes, part of that can be through your personality but there needs to be more than that. If you’re saying you can be all things to all people you are never going to be seen as that go-to-expert that we all know we need to be. 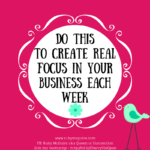 In my Rock Your Visibility Bootcamp we work on getting this really clear – yes it hurts your brain – no it doesn’t mean you can’t have variety in your business, it just gives you focus, and focus my dahlinks is one of the key ingredients for growing your business. When people think of you, they should be able to say what you do quite quickly, at least have an idea of the kind of thing you do, rather than you just saying you help the world and his dog. How can people refer you if they don’t know what you do? Since getting really clear on my messages, I get loads more referrals because it’s clear what I do and who I help. I still get to have lots of variety under that umbrella, thank goodness or I’d go nuts to be honest. When you know this stuff it really helps you – it makes it SO much easier to make decisions in your business – because you know immediately if someone is going to be a good fit for you or not, and not even just someone but projects that come your way because they fit your business model. So, I ask you again – why should I work with you and not one of your competitors? If you’re feeling like Sally then start to get clarity and turn that around. You can have a business that you love that also brings in money. You just need to do it differently! Call to action: Get really clear on what you want from your business, who you want to work with, and in what capacity. If you really don’t know, write down what you don’t want, and then flip that list into the opposite. You may find some hidden gems.